Lema Labs is a company founded by IIT Alumni under the guidance of faculty members of IIT Madras.We are striving to build an ecosystem for emerging technologies by providing support to stakeholders which include student community, educational institutions and the industry. Dr. TS Natarajan is a Professor in the department of Physics at Indian Institute of Technology (IIT), Madras. He is one of the 10 most popular professors on YouTube. He has been doing immense research in the field of Conducting polymers, Molecular electronics, Instrumentation. Arul Dev is an engineer from Birla Institute of Technology and Science (BITS), Pilani, India. He founded People First (www.peoplefirst.co.in), which focuses on recruitment, training and consultancy. He leads the recruitment team based out of Chennai, which focuses on middle and senior management hiring. The selection process is increasingly being centered on an Aspiration centered approach. Ganesh LS is the Professor at Department of Management Studies (DOMS) and is Dean of Students at Indian Institute of Technology (IIT) Madras. He has been a key member of several national-level projects sponsored by ISRO and MHRD, World Bank and the UNDP. 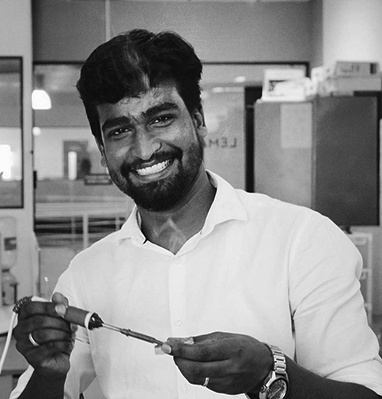 A graduate of State University of New York and IIT Madras, Senthil Nathan is a life-long entrepreneur with wide-ranging experience in multiple global technology-related businesses, with major strengths in product development/deployment and engineering management. He founded one of IITM’s first start-up ventures, and is an active member of the IIT Madras Entrepreneurship Forum. Kedar graduated from IIT Madras. He heads execution at Lema Labs. He is also the founder of HyperVerge and Computer Vision Group at IIT Madras. He loves long hours at office, bike trips, good food and yoga. Jeswin handles the school programs and hiring. He always thinks out of the box and enjoys working on projects in embedded systems. His definition of working out, being the pillion rider and driving 5 kms for Pokemon Go. Pawan heads the Robotics and Operations team at Lema Labs. He enjoys teaching and can make difficult topics seem easy. Over the years Lema and Pawan grew in size in tandem. Benishia is involved in developing video tutorials. She likes challenges and looks to master new things everyday. She feels cold under the sun. Parthiban heads the sales and business development team at Lema. He is a people person & an all-rounder in sales and cricket. Tech enthusiast & delivered guest Lectures, seminars & workshops in more than 50 colleges.